Vino Nobile di Montepulciano winetasting with Tuscan wine tours. Montepulciano, is an attractive little mediaeval town south of Siena, home to the famous Vino Nobile vineyards and also more recently famous for the vampire movie "New Moon" that was filmed here. The grape used to produce Vino Nobile di Montepulciano is prugnolo, a variety of the sangiovese grape. 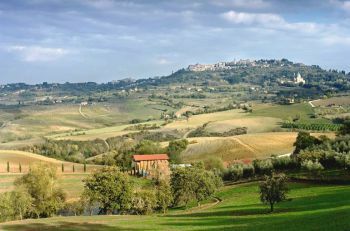 Montepulciano was founded in the 6th century and it is located in a remarkably picturesque setting on the top of a tufa hill surrounded by vineyards. The regulations for Vino Nobile, a DOCG wine, are very strict regarding the production area (only the territory of Montepulciano), the grapes (prugnolo), the alcohol level (minimum 12%), the aging (for three years after the harvest year and for four years for the Riserva), and the bottling location (must take place in the production area). Our first stop will be in Montepulciano to see some of the stunning Etruscans cellars now located under the town. 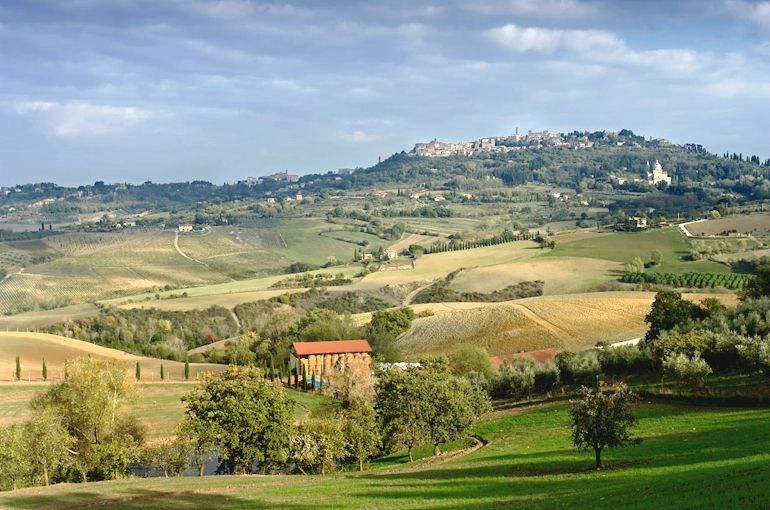 We will then go to one of the best vineyards to taste their Nobile di Montepulciano as well as their Super-Tuscan wines, and their olive oil. After a light lunch of traditional Tuscan food "under the Tuscan sun", we will visit another winery to taste their wines and olive oils. • 11.00 a.m. Arrival at Montepulciano and visit to the first winery, where you will meet the wine grower who will explain all the secrets of wine making, followed by a wine tasting. • 1.00 p.m. Light lunch at the local restaurant or at a winery. • 2.45 p.m. Driving through the hills where you will see the different types of vineyard. • 3.30 p.m. Visit to the second winery, where you will visit the cellar and have a second wine tasting. • 4.30 p.m. Return to Florence at approx. 6 p.m.